AltFanclub tracked down a musical visionary & fellow dweller of Seattle, London & Berlin. We speak to record producer & musician extraordinaire, Gordon Raphael. AltFanclub: Hallo Mr Raphael. How are you today? Gordon Raphael: Feeling warm and cozy in my apartment after taking Tiva, the Dalmation and 3 year old Francis Lorca Maguire on a bike tour of Berlin parks and coffee shops. Thanks for asking! AF: Thank you for taking time-out from your busy schedule to speak to AltFanclub. Berlin, Seattle, New York, London. Have I missed anywhere out? GR: I lived in Los Angeles (Hollywood and Downtown) for one year and had a studio in an olive orchard on the Greek island Corfu for a little while. It was spectacular there and well worth mentioning! 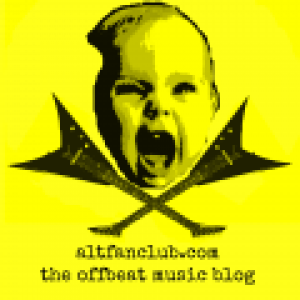 AF: AltFanclub were lucky enough to reside in Seattle for 2yrs (and discover the delights of KEXP radio). Do you miss the Pacific Northwest? GR: I am deeply and forever madly in love with the Pacific Northwest and Seattle as well. I especially LOVE the air, the trees, lakes, water, sky, clouds, coffee and the particularly strange aura (psychically, creatively and mentally) of the long time friends of mine there – who grew up breathing that rare air! I go back at least once a year for 3 weeks to a month – to recharge my cozmic batteries using the green atmosphere. AF: When we first arrived in Washington State, the first gig we attended was an Eddie Spaghetti benefit concert (of Supersuckers) @ El Corazon / The Funhouse. Mudhoney happened to be headlining. Is there a Seattle venue (past or present) that you hold dear to your heart? 1. The Vogue (previously WREX), when it was down in Belltown. It was the main nightlife – breeding grounds for artists, rockers, DJ’s, wannabes, amazingly dressed poseurs and all the people I wanted to hang out with and play my music for. My bands would play there as often as possible and it was one of the only venues in town that permitted original music. Also the first place to feature music videos and have killer sound and video equipment installed. 2. The Showbox, during it’s first incarnation as a Punk/New Wave center. 3. The BIRD, which was before both of these and is almost purely mythical by now! AF: We visited Central Saloon in Center City quite a few times. That place is heaped in history with old Soundgarden/Nirvana gig posters adorning their walls. Were you lucky enough to see any bands there, ‘back in the day’? GR: I saw Mother Love Bone, Scratch Acid, and Soundgarden. I’m quite sure I saw many other bands there too, but ..um, I can’t remember! AF: Your involvement with The Strokes is well publicised …[for those unaware, Gordon produced the first EP for The Strokes, their debut album “Is This It” & the follow-up, “Room On Fire”]… Whilst I’m sure you are incredibly proud of those achievements with them, do you think that was your defining moment, or do you wish to be remembered for anything else earlier or later? My former Seattle band Sky Cries Mary also gets some shining smiles- even to this day. Being “remembered” isn’t something I need so much, nor think about. However, being relevant and “paid attention to” in the present moment IS of ultimate importance to me! I like talking with people and working with artists/musicians on a daily basis for projects happening now. I also try and push as hard as I know how to make sure my own songs, videos and rare live performances are known about and hopefully noticed. There’s a lot of news, noise and info flying around at this moment – and its a f*@king JOY to have my songs played on radios, blogs Youtube – whatever! It’s so so satisfying. AF: 2017 has been an interesting year for music. It’s seen some impressive debuts, but also some returning familiar faces. What 2 albums have stood-out for you? GR: I’m a bad one for that. I’ll tell you why – I am so immersed in producing bands, and working on my own music, that I don’t really clock how music operates in a given year! For me, a year is defined by what music I worked on, OR what brilliant songs/ artists crossed into my awareness for the first time. Things I discovered this year that really blew me away were: Fjer’s “Her Turn” video, Ab-Soul (with Kendrick Lamar) video Turn Me Up; I had an obsessive year with Tyler The Creator watching his videos on loop, being delighted and disgusted and often mixed up as to which parts were which. (Especially love his “Find Your Wings” and “Rella”). Also I spent much time watching and re-watching Frank Ocean’s NIKES video my all-time favorite thing by him, and one of the coolest creative experiences I know of. AF: Has there been an album of 2017 that has blown you away enough, to make you think to yourself…. AF: What are you currently doing now, & what can we expect from you in 2018? GR: I’m talking with bands from USA and Europe about productions for next year, and hyping the living daylights out of the songs from “SLEEP ON THE RADIO” to build pressure and awareness before the release date. Other than that I’m riding my bicycle all thru my neighborhood in Berlin and planning a Euro-tour in April, with my new band, The Half Full Flashes. AF: What is your most treasured instrument or musical item? GR: Well, my aggressive attitude for making weird music and sounds with obscure poetry is the best weapon I possess! Then comes my Arp Odyssey Synthesizer, my old old Neve 1974 preamp with EQ and magical 1979 Fender Stratocaster. With these I am “well on my way!”. AF: Do you think there is still a musical legacy in Berlin, paved predominantly by Bowie/Eno/Iggy/Lou Reed. GR: Hmmm, for a certain age group – I was certainly meditating about Bowie and Iggy when I moved here, along with dreaming of Bach and the artist, Albrecht Dürer! My European fantasy heroes! AF: AltFanclub were sad to hear of Young Fresh Fellow‘s founding member, Scott McCaughey’s recent poor health & we wish him a speedy recovery. Had your paths crossed before in the busy PNW music scene? GR: I know for a fact that we were in the same room at HUNDREDS of gigs in Seattle, both watching each other’s bands and seeing all the cool bands that played in & out of town over decades. I don’t think we ever exchanged words though! AF: Finally, what are your plans for Christmas? GR: Gonna hang out with my dear friends the Maguires here in Berlin and enjoy the absolute quietest time of the year here. I also generally write new songs and have fun with recording my own stuff since almost everyone I know is out of town visiting their families!